Professor Subra Suresh introduces Materials Today's inaugural Materials in Society lectures. From construction and electronics, through to energy and medicine; materials science and engineering has made significant and enduring contributions to the lives of every human being. It's an open secret in academia and industry, but is the public aware of the role materials science has in shaping the world? Who are these people working to provide clean energy, build smarter homes, repair our bodies, not to mention upgrade our smart phones? Materials Today is highlighting the impact materials science has on our everyday lives in a series of online lectures that everyone can access, understand and appreciate. The Materials Today Materials in Society lecture series will reveal how materials science is tackling some of the world's biggest issues and explore the huge improvements the applications of research make to the way we live and work today. Highlighting novel approaches to the use of materials science in tissue engineering that are likely to prove very powerful in the engineering of tissues ranging from bone to cardiac tissue. Focusing on energy storage materials to address some universal themes covering the difficulties and opportunities that come with trying to create and bring new kinds of functional materials to the market. "The Wonderful World of AIEgens: Respect nature, influence future"
The weak emission of AIE fluorogens (AIEgens) as molecular species and their bright fluorescence as nanoscopic aggregates distinguish them from conventional organic luminophores and inorganic nanoparticles, making them ideal candidates for high-tech applications in electronic, environmental and biomedical applications. "Carbon and carbon hybrid materials for electrochemical desalination"
One of the most exciting and pressing areas in which materials science could solve a critical global problem is in the area of desalination. As climate change and other factors begin to impinge even more on fresh water supplies and environmental pressures marginalize vulnerable communities particularly in remote parts of the world and in the developing world, desalination is becoming increasingly important. In this lecture, Prof Volker Presser explores why we need carbon materials to help us design cost-efficient and sustainable desalination technologies. "Unravelling the Complexities of Electrochemical Energy Storage at the Nanoscale"
The lecture covers how electrochemical energy storage is a key component of creating a sustainable energy system for our future. The focus of the lecture is on the novel materials, designs and devices needed in battery technology. 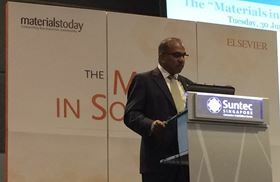 "Diamond Quantum Probes for Bio-Sensing and Imaging"
"Optimisation of the structure and performance of nanomaterials"
Subra Suresh shares his thoughts on the Elsevier Materials Science Council and its role within the materials science research community. Find out more about the Elsevier Materials Science Council. Raising the profile and supporting the efforts of materials science research.